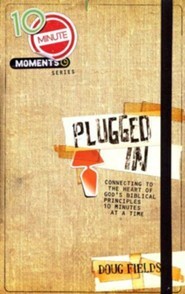 10-Minute Moments: Social Justice gives students a biblical foundation for making a lasting, life-changing difference in this world. They'll discover how God loves justice, and they'll consider how they can honor God through their involvement in social justice issues. 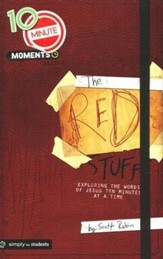 They'll also encounter stories of from the life of author Brian Cress-director of student mobilization for International Justice Mission-and from the lives of students and This engaging book is a 31-day devotional that's set up as a journal. Each day, students read a Scripture dealing with God's heart and passion for justice, chew on a few thought-provoking questions, consider simple action steps, and then pray a simple prayer to close the reading. It's a one-month plan that's easy to read and easy to stick with. If youre like many teenagers today, youre tired of living in a world filled with injusticebut what can you do about it? 10-Minute Moments: Seeking Justice will give you a biblical foundation for making a lasting, life-changing difference in this world. Youll discover how God loves justice, and youll discover how you can honor God through involvement in social justice issues. Youll also encounter stories from the life of author Brian Cressdirector of student mobilization for International Justice Missionand from the lives of other teenagers and people whove been rescued by IJM. 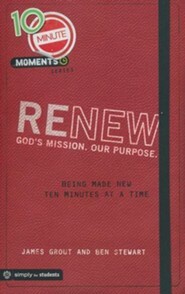 This 31-day devotional is set up as a journal. Each day, youll read a Scripture dealing with Gods heart and passion for justice, chew on a few thought-provoking questions, consider simple action steps, and then pray a simple prayer to close the reading. Its a one-month plan thats easy to read and easy to stick with. 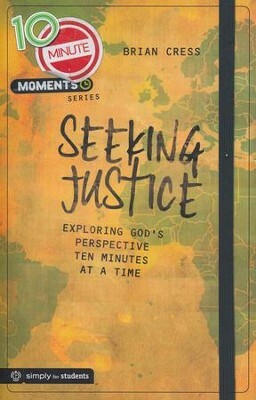 Written in partnership with International Justice Mission, 10-Minute Moments: Seeking Justice will help you explore what the Bible says about social justice in our world todayand how you can make a meaningful impact in other peoples lives! Brian Cress is Director of Student Mobilization-Youth for the International Justice Mission in Washington, D.C., where he works to connect youth ministries with the goals and strategies of IJM. Before that, he was a longtime local church youth pastor who also helped lead a large network of youth ministries in Washington state. Brian and his wife Lori, who serves as an IJM Justice Advocate volunteer, live in Bellevue, Washington, and have three grown children. I'm the author/artist and I want to review 10 Minute Moments: Seeking Justice.